Most Mountain Devils events require you to enter online prior to the day. This allows the organisers to have pre-printed maps ready for you on arrival. Click on the online entry link found in the event details and complete the form. A list of coming events can be found on this website on the Events page. To display the details of an events, directions to the assembly area and link to the online entry page click on the event name. The closing date for entries is usually the Sunday prior to the event. Late entries may be offered, at the organisers discretion. An off-road bike in good working order and a standard bicycle safety helmet are compulsory. Map board which attaches to your bike and keeps the map easily in view whilst riding. A limited number are for loan at each event, indicate on the entry form if you would like to loan one. Wear your normal riding gear and bring a water bottle and a rain jacket. Compasses are useful to orient your map to north and can be hired at the event, if desired. A whistle - to attract attention in case of emergency. As with all outdoor activities, it is a good idea to cover up and use sunscreen. The nature of MTB orienteering is such that you are in a relaxed forest environment and a picnic lunch is a great way to finish (or start) off the day. Instructions of how to get to an event can be found in the event details. Often signs are placed near the event location to guide you to the parking area. The signs are either words, or an "orienteering flag" symbol in orange and white. This orange and white flag symbol will become familiar to you because it is used throughout orienteering, as an actual flag and also as a symbol as drawn above. When you arrive at an event you will need to register yourself to let the organiser know you have arrived. 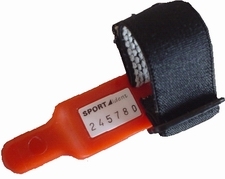 If you have hired a Sport-I-dent (SI stick) or a mapboard you will collect these at the registration desk. If there are any course-setter instructions they will also be available from the registration desk or nearby. Such instructions might include last minute map corrections (often displayed on a map near the registration), out of bounds areas or other useful information about the area. It is a requirement for some major events to have your SI-stick attached to your bike, such as the NSW Championships. If this is a requirement it will be in the pre-event instructions. While most Mountain Devils events use SI-sticks to record the time you arrive at each control, occasionally you will be required to use the (old fashioned) punch card system - see section on what to do when you get to a control).